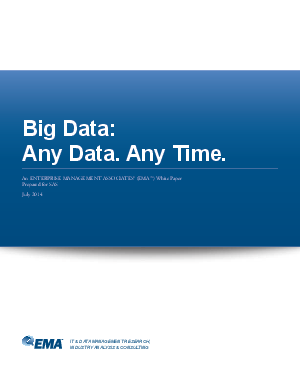 Big Data initiatives are not just about storing information and playing around with it. Big data projects leverage information from around the organization in order to solve analytical challenges in near real-time. However, some organizations are struggling with making their big data actionable and it really should not be too difficult with the right infrastructure. Download this whitepaper to learn how to maximize the potential of your big data and see how this will give your organization the competitive advantage of generating solutions at any time and date.